Some days you just need to bake a cake for no other reason than to lift your spirits! I had one of those days recently, and decided to give Saveur’s coconut cake a whirl. 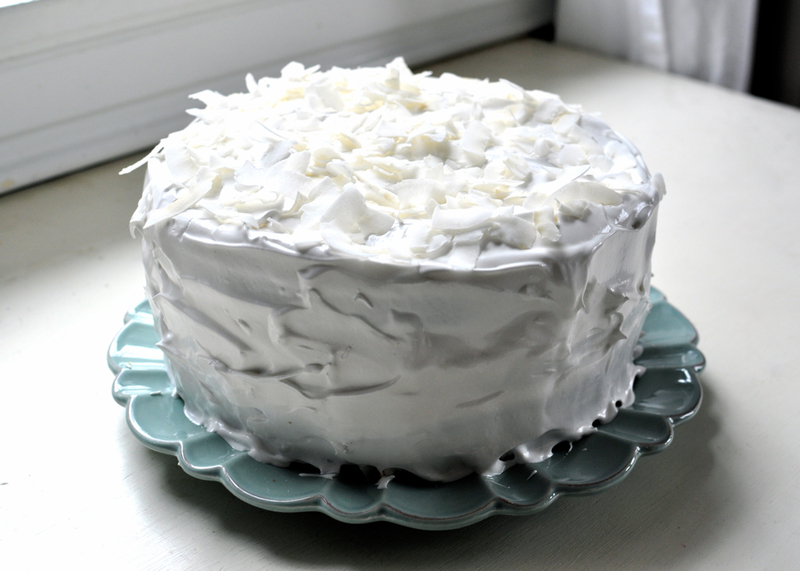 With its bright white frosting and large shavings of coconut, it reminds me of the Easter cakes I used to covet when I was a child. Be warned— this cake is very sweet! But tons of fun to make. Make the cake: heat oven to 350. Grease and flour two 9-inch cake pans and set aside. Whisk together flour, baking soda, and salt in a bowl and set aside. Whisk together buttermilk and vanilla in a bowl and set aside. In a stand mixer, cream butter and sugar on medium-high speed until pale and fluffy (about 3 minutes). Add eggs one at a time, beating well after each addition. On low speed, alternately add dry ingredients in 3 batches and wet ingredients in 2 batches. Increase speed to high and beat until batter is smooth, about 5 seconds. Divide batter between pans and smooth top. Bake about 35 minutes, until toothpick inserted into center comes out clean. Let cakes cool in pan before inverting onto wire racks. When completely cool, use a serrated knife to halve each cake horizontally, producing 4 layers. Make the frosting: place egg whites and cream of tartar in bowl of the stand mixer fitted with whisk and beat on medium-high speed until soft peaks form. Turn mixer off. Bring sugar, syrup, salt, and 1/2 cup water to boil in a saucepan over medium heat, stirring to dissolve sugar until a nearly-clear syrup forms (about 5 minutes). Turn mixer to medium and very slowly drizzle hot syrup into egg whites while beating. Add vanilla and increase speed to high; beat until meringue forms stiff peaks and is slightly warm to the touch, 3 minutes. 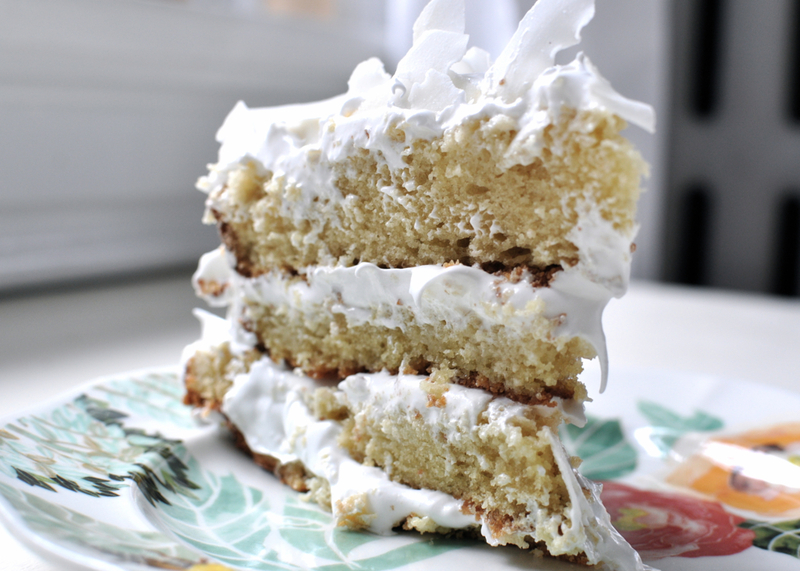 To assemble, place one layer on a cake stand or plate, drizzle with 3 Tbsp coconut water, spread with 1 1/2 cups frosting (I found it easier to estimate because the frosting is the consistency of marshmallow fluff and quite sticky! ), and sprinkle with 1/2 cup coconut. Place another layer over frosting and repeat the above steps until all layers are covered. Cover top and sides with remaining frosting (I didn’t use all of it) and cover outside of cake with remaining coconut, or just cover the top. Chill cake to firm frosting. Serve chilled or at room temperature. Enjoy! This is quite a sweet cake because of the frosting, so I think if I make this again I will use a less saccharine fresh whipped cream frosting with coconut sprinkled on top. But it would make a great decadent Easter dessert to bring to a party! I wish I liked coconut – it’s one of the few things to eat that I don’t like. But it’s so,so pretty. I use (refined) coconut oil a lot, and love coconut milk (like in curries) but I can’t do the flaked coconut or any kind that has a strong smell. What did you think about the cake itself? 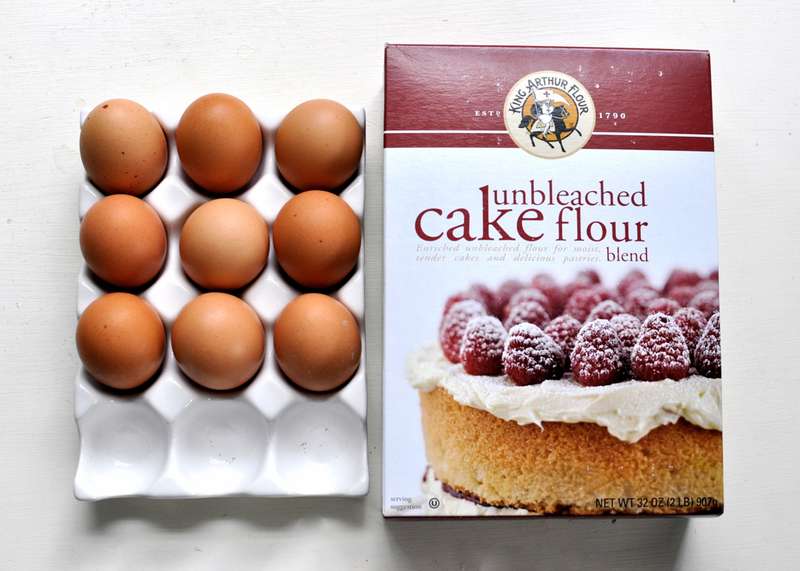 Was it a keeper, even if you swapped out the frosting for something different? It looks delicious in the photos! I’m with you on a non-sweet frosting. The last one I made was a mascarpone frosting and it was divine, and the first time I didn’t leave a pile of frosting on the plate. 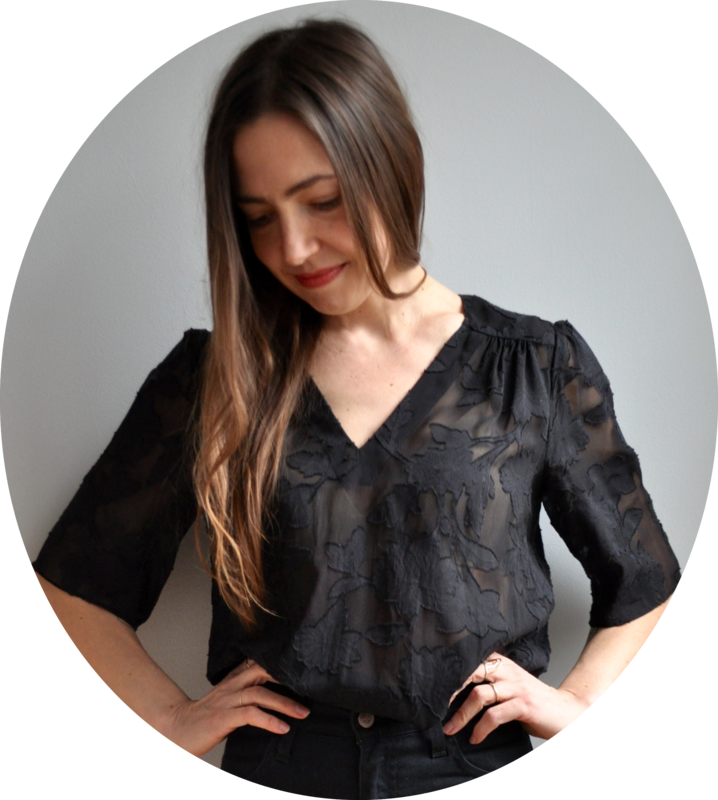 Did you see the cake on Smitten Kitchen this morning? I saw the post just after I left my last comment, so it was meant to be. I think that’s the one I’ll make this weekend! As for the carrot graham layer cake on Smitten Kitchen… yum! I like that it’s not loaded up with frosting! Let me know how it turns out if you make it. I’m a big carrot cake fan, though my version has coconut in it so you may not care for it, ha! I’ve made that cake. It’s fun to make and delicious with a cup of coffee! Yum!!! I made a toasted coconut cake for my husband’s birthday last year and it was SO good. I’m not a huge coconut flavor fan but something about the flavoring in cake form makes it delicious.